Steak Butter Recipe - Italian Herbs - Perfect for Red Meat! 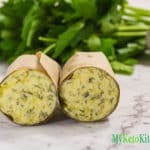 This tasty butter is full of fresh herbs and garlic to create one delicious Italian Flavored Steak Butter. It’s another addition to our collection of compound butters to add fat and flavour to your meals. Allow to set in the fridge for 20 minutes before serving. Store in the fridge for up to 3 weeks, or in the freezer for 3 months.